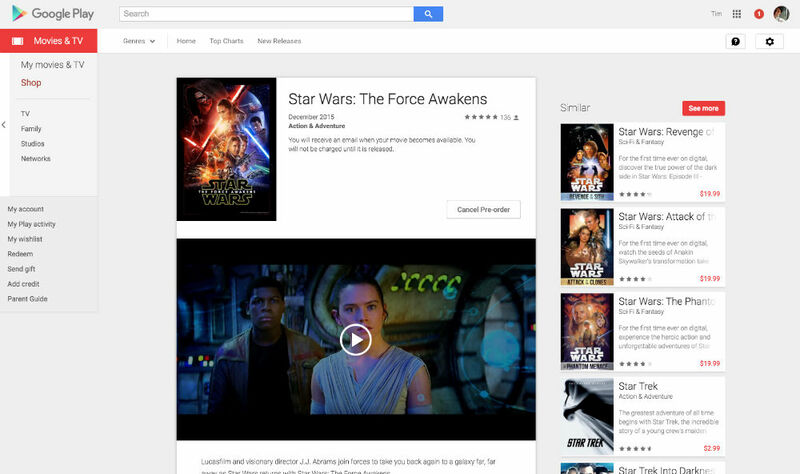 Like all other blockbusters from this year, Google has been quick to list movie titles for pre-order on Google Play, which is what just happened for Star Wars: The Force Awakens. Whether you lined up last night or plan on seeing it this weekend, there is hardly a shred of doubt in my heart that many of you will go home from the theater and want to own this movie. For the SD version, the price is set at $14.99, while the HD version is listed at $19.99. While no official release date has been set from the studio, estimations are that April will be the month of release. And if you need the music in your life, you can find the official soundtrack right here for $11.49.